of phobias, such as fear of flying, spiders or public speaking, has now branched into the treatment of Post Traumatic Stress Disorder (PTSD). With so many of our veterans having seen active duty, the incidence of PTSD has increased alarmingly. 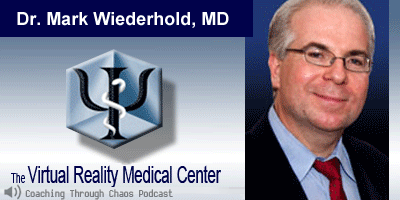 In this seminal podcast, Dr Mullen interviews Dr Wiederhold of the VRMC, and finds out about the exciting developments and therapeutic capabilities for our wounded warriors. As part of this podcasting series, Dr Mullen will be dedicating one episode per month to services to help our Veterans and First Responders.